Iced Coffee and Coldbrew are all the rage right now. I find this newfound enthusiasm for coffee to be fantastic. This is coming from the perspective of someone who wants to improve your experience and get you exploring more delicious coffees. These cold and iced brewing options bring you a different perspective on coffee. In many ways, iced coffee and cold brew in particular makes it easier to get into drinking coffee with nothing added. This is because often coffee brewed this way comes off less bitter and more sweet. But there are some significant downsides to the ways in which you can prepare coffee cold. This method of brewing coffee is typically done in a lengthy immersion method. You start off with (a lot of) coarse grounds, added to a large chamber, and then you proceed to add a large quantity of lukewarm or cold water. At this point, you stir the coffee and then let it sit for 12-24 hours (either on the counter or in your fridge). The main idea here is that you aren’t using any hot water. And that’s where the main problem with cold brew originates. In order to brew a full and proper extraction (of all the balanced flavors of a coffee), you must use heat. There are certain soluble components of roasted coffee which can only be extracted in water using heat. These are primarily acids of the coffee, responsible for the brighter and more complex flavors. Industry professionals are critical of cold brew because of this – you aren't getting all of the coffee's flavors in your cup. Many people at the peak of quality in the coffee industry are focused on representing the farmers work to it’s fullest. It is no surprise then that you would find discontent in a brewing method which does not meet that objective. But also, many cold brew coffees end up tasting the same, even if their hot brewed counterparts are wholly and very clearly different. So you might then make an Iced Coffee using a hot brew. This method is typically done using the Japanese Iced Coffee method. This technique is only possible with pour-over and drip style brewing. In these methods, coffee is placed usually in a paper filter, and then water is poured on top. Coffee ‘drips’ through the filter into the vessel below. 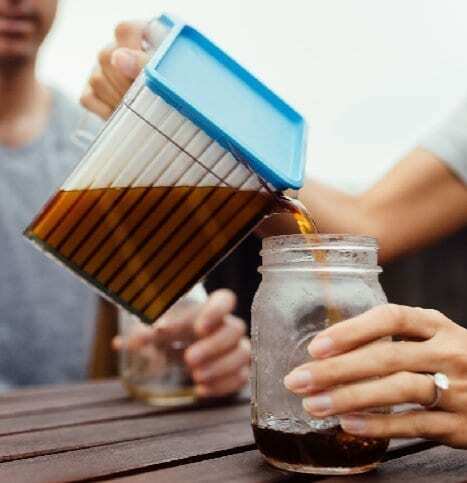 To brew using the Japanese Iced Coffee method, you begin by adding ice into your vessel below the filter with coffee. You then adjust your brewing to account for the ice such that your total water and coffee ratio is still the same. I do this by taking the total water I would use brewing and placing 1/3 of it as ice into the brewing vessel. Then to compensate for pouring less water through the grounds, I’ll grind slightly finer. The problem with this iced method? Yes you get hot water to fully extract the range of compounds. But unfortunately, because you aren’t completely brewing with all the water, your extraction balance will be off no matter what you do (even if you grind finer or add more coffee). At best, you are brewing a more concentrated pour over and then diluting and chilling it with the ice. You might say, why not brew hot regularly, and then let it cool off and/or throw it in the fridge. The problem with doing that is your coffee either needs to sit out and cool off over too long a period (do you really want to wait an hour for your coffee to cool?) or you have to add a hot steamy carafe to your fridge, which is very bad for everything else in there. In the form of The Coldwave. This coffee chiller is blindingly simple. All you need to do is brew your coffee however you wish. Then you pour it into the Coldwave carafe and add the frozen insert. 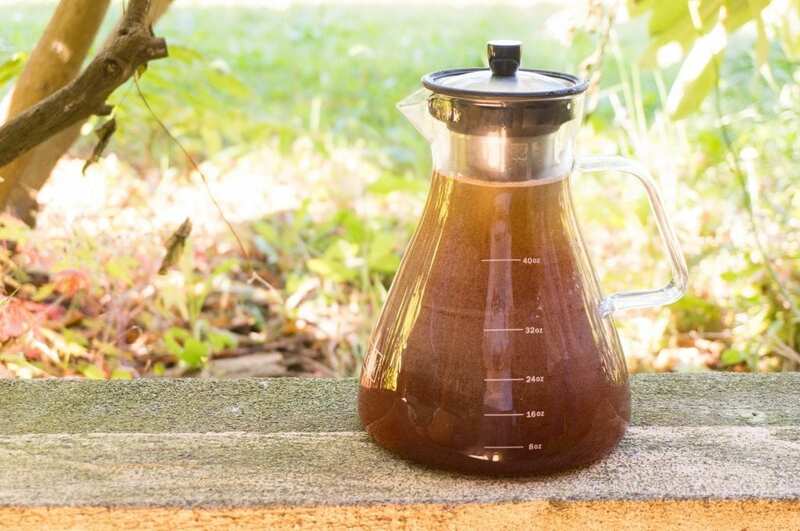 In 2 minutes, freshly brewed coffee will be chilled down to 40 degrees F. Perfect iced coffee with no dilution. Aside from the simplicity of The Coldwave (anyone can use this, it requires no special knowledge or experience), you have the added benefit of being able to chill more than just pour over / drip coffee. You can flash chill your French Press. You can flash chill even your latte (imagine a chilled latte without having to worry about ice diluting your drink). Check out my video review of The Coldwave and then go grab one for yourself.